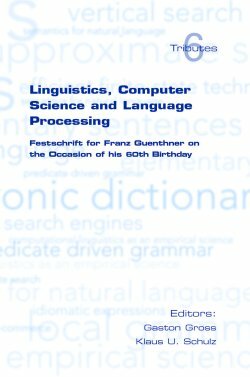 This festschrift in honour of Professor Franz Guenthner's sixtieth birthday, presented by some of his friends and colleagues, covers the whole area of automatic language processing, of which he is an eminent specialist. The topics covered range from the semantics of natural languages to predicate grammar, from local grammars to efficient finite-state techniques and from Internet search engines to the design of electronic dictionaries. They all bear tribute to Franz Guenthner's ambition to make computational linguistics a truly experimental science.